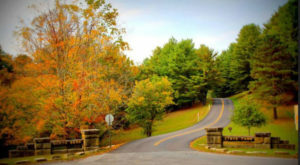 Growing up in the Mountain State, we learn at an early age both the beauty and the spoils of family pride. 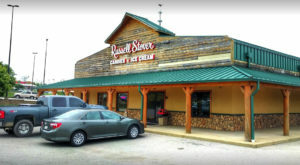 The lesson is usually learned in school and entails the famous feud (some say over a pig, others say it was much more than that) between the Hatfield and McCoy families. Thanks to modern technology (the Internet and several made-for-television documentaries and mini-series), the famous feud has turned the two families into legendary royalty in the minds of many in the home states where the two clans reside. 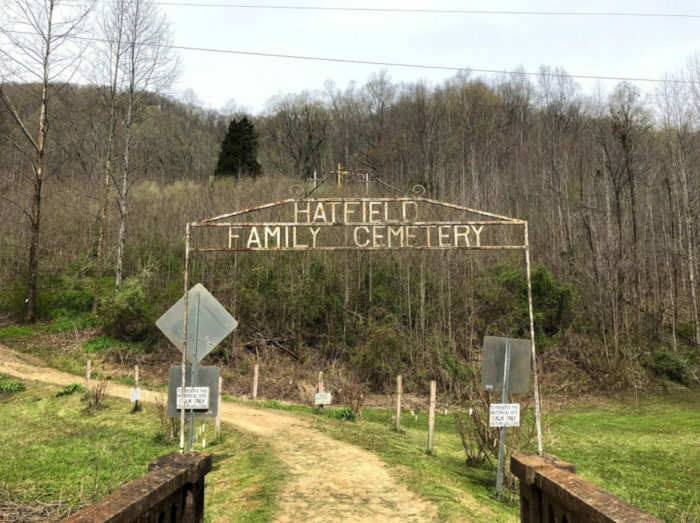 And you may be surprised how many West Virginians make the pilgrimage to the Hatfield Family Cemetery to pay homage to Devil Anse and his brood of children, whose graves surround their patriarch like soldiers guarding sheer royalty from beyond the grave. 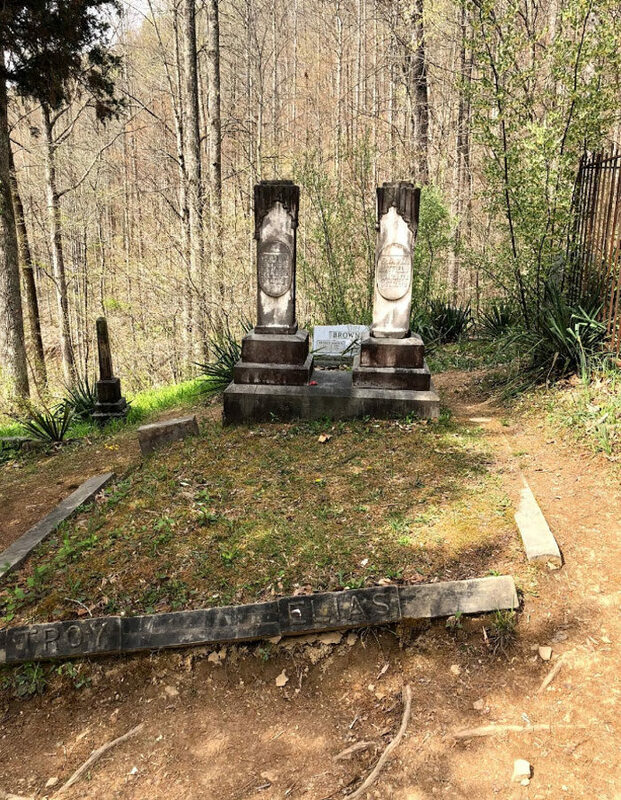 Getting to the Hatfield Family Cemetery near Sarah Ann, WV is something you really need to want, because it's well out of the way and tucked neatly up on top of a high hill. 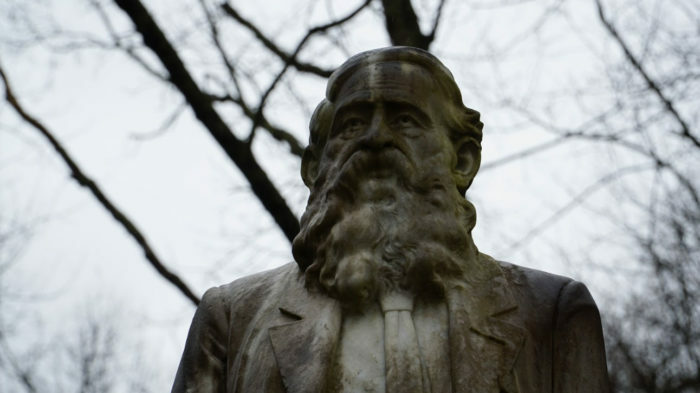 The two sections of the cemetery are easily reached by way of a footpath that eventually winds its way up the hill to the majestic life-sized statue of William Anderson "Devil Anse" Hatfield towering over the plots of his children and reigning king over the entire cemetery. 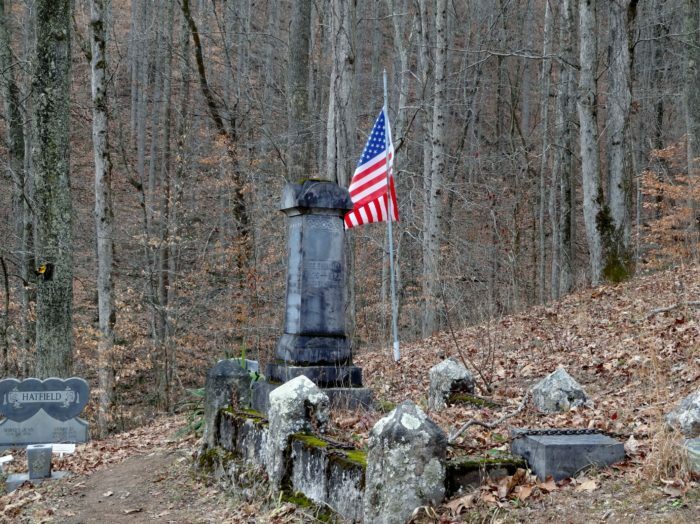 Don't be surprised to find a variety of flags posted all over the Hatfield Cemetery. We're unsure if visitors bring in the flags or if family members do it. 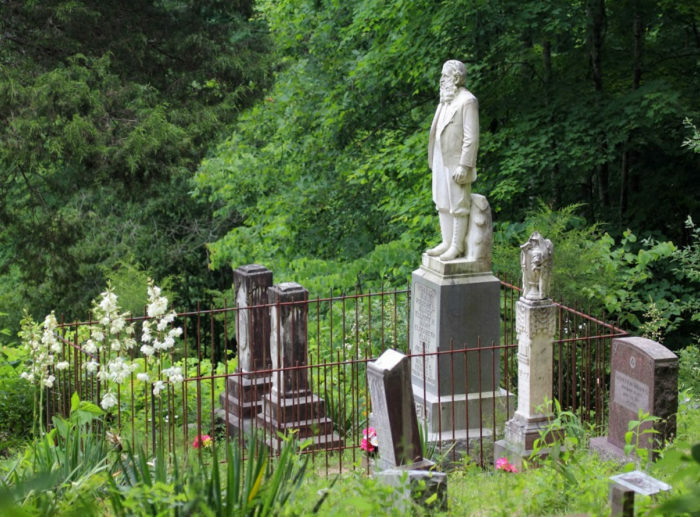 The statue of Devil Anse usually has at least one or two Confederate flags posted on the immediate family plot. 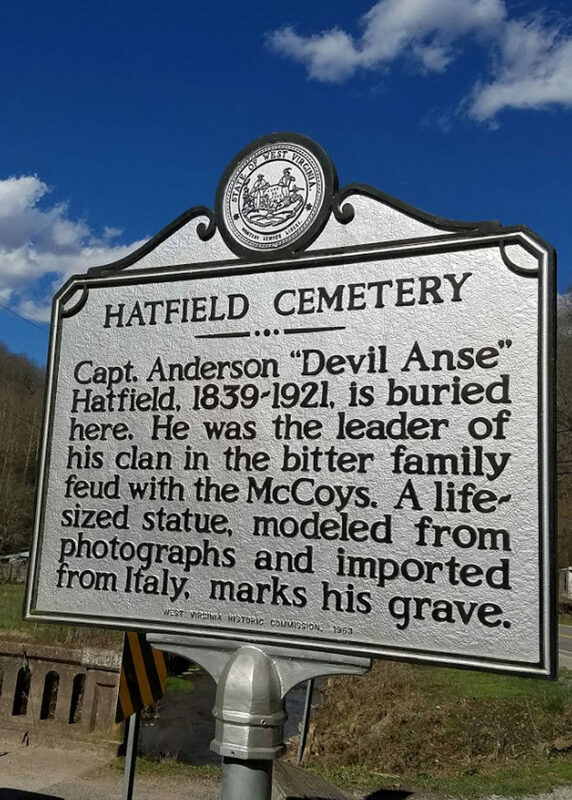 One would certainly surmise that it would bring great comfort to Devil Anse Hatfield to be surrounded by his children. He was blessed with 13 kids to add to the Hatfield Clan; nine of which were sons. 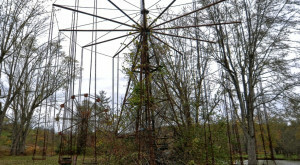 But some visitors to this legendary cemetery say they've encountered some odd occurrences, so don't go alone. 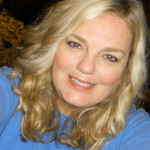 You won't want to find yourself in a panic all alone if you are suddenly stuck with an unusual feeling — or have something that feels like a paranormal experience. 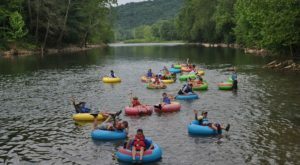 Some of the most circulated ghost stories here involve foggy nights, when Devil Anse is said to round up the boys and go marching down to the water by the roadside. 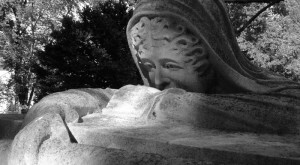 Folks driving by late at night have reported seeing what appear to be figures at the foot of the hill by the small bridge that crosses under the cemetery sign. And all who've seen them, swear it's the ghosts of Devil Anse and his sons. 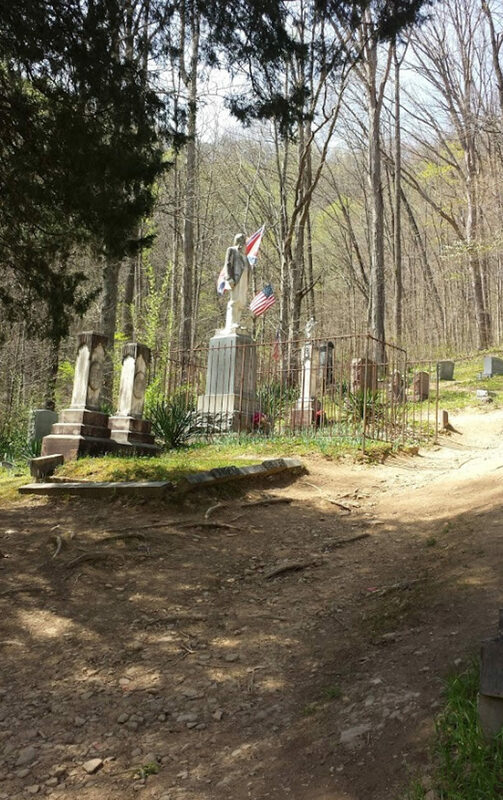 Have you ever made the trip to Sarah Ann, West Virginia just to visit the Hatfield Family Cemetery? 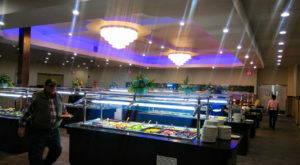 We’d love to know about your experience! 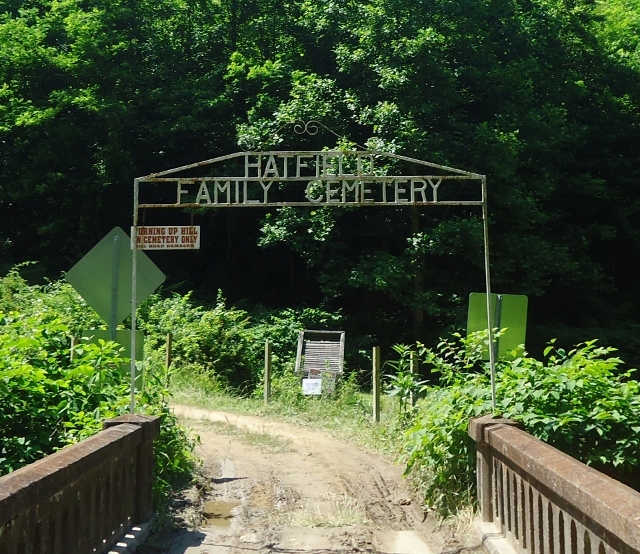 This Hatfield Family Cemetery Is located a couple of miles south of Sarah Ann. 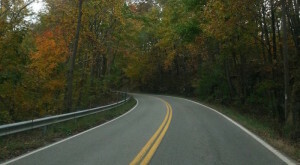 The cemetery and the access road can be found on this Google map link. Editors Note: Please be respectful if visiting this family plot. 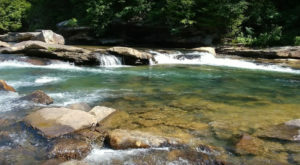 Follow the rules of a hiking trail, and leave no trace behind.